Environmentalists are pushing for 100 percent clean power by 2045, while utilities are wary of the costs and risks of leaving behind all fossil fuel-generated electricity. Washington environmentalists — stung by the November election defeat of a carbon-pricing initiative and repeated failures to pass ambitious climate bills in Olympia — hope to regain momentum with legislation that would usher in an era of cleaner power generation. House Bill 1211 would require Washington utilities to be carbon-free by 2045, and if they fall short — risk financial penalties. The legislation is facing strong pushback from critics who say purging the grid of all greenhouse-gas emissions from fossil fuel could be too expensive and increase the risk of power restrictions or blackouts. “If enacted in its current form, Washington’s electric system will cost more and be less reliable,” Nicolas Garcia, policy director of the Washington Public Utility Districts Association, told the House Finance Committee this month. Garcia and other utility representatives are calling for the Legislature and Gov. Jay Inslee to rally around the provisions in an alternate proposal, Senate Bill 5116, which also includes a 2045 phaseout deadline. But it offers a more flexible approach that could make it easier — even after that date — for some utilities to continue to draw power from natural-gas plants that produce greenhouse-gas emissions. Environmentalists, who have favored the House bill, are hopeful a compromise can be reached that would still give utilities a strong push to turn away from fossil fuels. One key question is whether the House bill’s penalty for failure to meet the 2045 deadline would make it into a final measure. “We see a lot of commitment in both chambers, and are optimistic that … a significant piece of climate legislation will pass this year,” said Vlad Gutman-Britten, of Climate Solutions, an environmental group advocating for a shift away from fossil fuels. The clean-power bills in the House and Senate are part of a package of carbon-cutting measures backed by Inslee, who is likely to make the threats of climate change his main message if he runs for president. Inslee also is calling for passage of legislation to lower — over time — the carbon content in transportation fuels, improve energy conservation in buildings, eliminate use of hydrofluorocarbons in air conditioners and support increased use of electric vehicles. Inslee, in an earlier interview, said this year’s climate agenda has the potential to reduce carbon by amounts equal to past legislative proposals, which included putting a price on carbon pollution. Such measures, such as a carbon tax or fee, make oil, gas and coal more expensive and thus encourage alternative sources of energy. But carbon pricing in Washington state carries considerable political baggage: Two carbon-pricing ballot measures have gone down in defeat, and the Legislature has repeatedly balked at this approach. In 2019, the prospects for passage of climate legislation are bolstered by the election gains of Democrats, who control the majority in both chambers. Both the House and Senate versions of the clean-power bills have made it through committees, with floor votes expected in the next few weeks. Clean-power legislation — if passed into law — would shape the evolution of Washington’s utility industry for decades, helping to determine how far and how fast to reduce greenhouse-gas pollution from electrical generation. Crafting such legislation is a key part of the ongoing struggle to determine how — at the state level — to respond to the global threat posed by the atmospheric buildup of carbon dioxide and other greenhouse gases released by the combustion of fossil fuels. Carbon-free hydropower, which harnesses the force of falling water, already is the backbone of the state’s electricity system. But the amount generated varies from year to year depending largely on the size of the winter snowpack. Even in a strong water year, such as 2017, about 24 percent of the state’s electricity still came from coal and natural gas. And some utilities depend much more heavily on fossil fuels, including Puget Sound Energy (PSE), Washington’s largest private utility, which in 2017 drew about 60 percent of its power from these two sources. Both the Senate and House bills call for a relatively swift end — Dec. 31, 2025 — to Washington’s reliance on coal power that ranks as the most polluting form of fossil-fuel electricity. 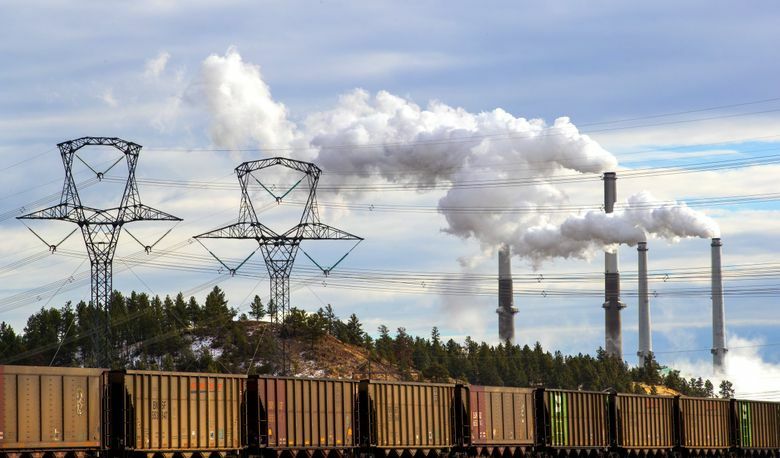 That would have a big impact in Montana, where Puget Sound Energy is part owner of a major coal-fired plant in Colstrip that — if the legislation passes — might not be able to survive past the mid-2020s deadline. Amid the legislative debate over the bills, the future of natural-gas power in Washington is more uncertain. Currently, there are more than a dozen natural-gas plants in Washington, mostly in the western half of the state. Some energy analysts say that, even taking into account technological innovation, there likely would be big dollar savings if some natural-gas power feeds into a future grid that is expected to draw much more heavily on solar and wind power. During infrequent winter cold snaps, the wind may die down for days on end, and the hours of sun would be at a low ebb. As power demands surge, the natural gas could kick in to keep the electric grid in balance. Under this scenario, some Northwest utilities might still get 5 to 10 percent of their midcentury power supply from natural-gas plants, according to Arne Olson, senior partner at E3, a consulting firm that analyzed the impacts of a cleaner Northwest electricity in a study paid for by utilities and utility groups. “What our work is showing is that — trying to do wind and solar alone — without this (natural gas) — is very, very costly,” Olson said. Tarleton is optimistic new energy technologies will evolve to replace natural gas. As scientists outline the increasingly dire threats of climate change, she wants the Legislature to compel utilities to go as far as possible to eliminate greenhouse gases. Her bill offers offramps, so in the event compliance costs appear too great, utilities can go to regulators to seek a waiver to the 2045 standard. If regulators don’t approve such a request, her bill calls for a significant penalty — $100 per megawatt-hour (roughly equivalent to the amount of energy used by 300 homes in an hour) on utilities that fail to comply. “I am trying to keep the pressure on,” Tarleton said. Tarleton said the bill’s 2045 penalties are disliked by utilities, including PSE, which given its current heavy reliance on natural gas and coal would have to make huge changes to get to 100 percent carbon-free power. PSE, in a statement to The Seattle Times, said it will work with lawmakers “to advance polices to reduce carbon emissions” while maintaining affordable and reliable service. Utilities, under the Senate bill, would risk penalties of $60 a megawatt hour if they did not meet interim goals for phasing out greenhouse-gas emissions. The legislation does not impose a penalty for failing to get to 100 percent clean energy by 2045. “The Senate makes it a goal — not a mandate as a penalty and that’s a huge difference for us,” said Garcia, of the Washington Public Utility Districts Association. Carlyle said either bill — if passed into law — would make Washington a U.S. leader in cutting greenhouse emissions in the power industry. Staff reporters Joseph O’Sullivan and Jake Goldstein-Street contributed to this report.